Here at Macayo’s, we’re always looking for ways to improve our customer experience. 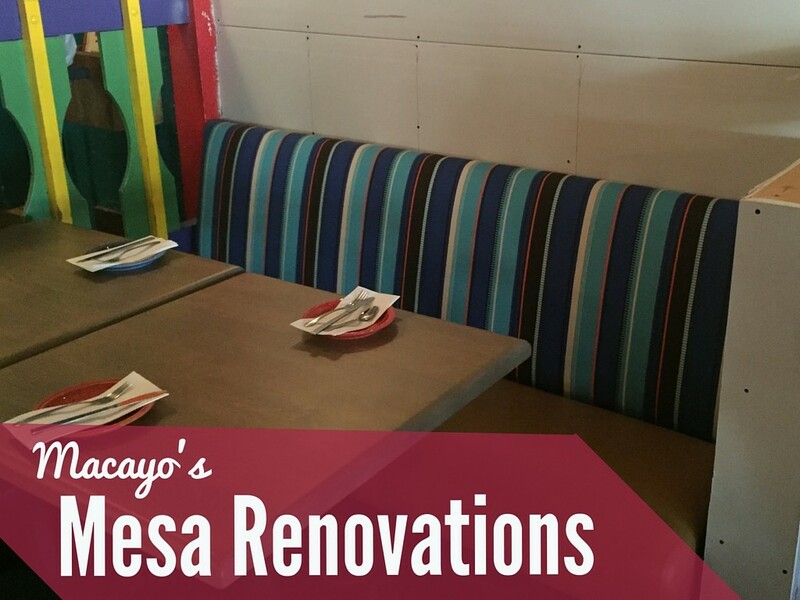 So in addition to continuing to serve up the best authentic Mexican food in Mesa, we’ve also decided to do some renovations and upgrades at our eastern-most Macayo’s location, which opened back in 1982. Want a sneak peek of some of the changes we’re making? We’ve got the scoop right here! For starters, we’ll be replacing some of the existing seating with new and colorful booths. We believe these new booths will be great for providing an intimate yet comfortable dining experience for small groups in addition to helping us achieve a more fun and festive look inside the building. We’re also planning on opening up a brand new front patio, which will provide additional seating for our guests and give them the option to enjoy their meals in the fresh air. Having a front patio will also create a welcoming appearance at our entryway! Spend the next beautiful evening dining on our outdoor patio while you take in the sights that Mesa has to offer. To better accommodate larger groups, we’re also adding a large community table, which will provide ample seating for special events, gatherings, and bigger parties. This will save us from having to rearrange tables to accommodate these groups, which improves your overall dining experience! The next time you plan on coming in with a large group, give us a heads up so we can reserve this community table for you. With all of these improvements, there are still plenty of aspects of our Mesa location that won’t be changing. This includes our extensive menu of authentic Mexican food and our friendly service! And for those who were concerned, don’t worry: we’ll still be bringing in our famous balloon man every Friday night for your family to enjoy. This is just a sneak peak of the biggest changes that are in store for our Mesa location. We’re sure that these upgrades will help to improve our guest experience, so be sure to stop by and see for yourself!